CBN's Operation Blessing provides disaster relief from national offices around the world. International teams mobilize quickly and work alongside churches and local community leaders to bring aid where needed most: clean water, medical care, food, shelter, and basic essentials such as soap, blankets, and hygiene kits. Wars, floods, hurricanes, typhoons, and earthquakes— natural or man-made disasters – can strike anywhere, as we’ve seen. The damage can be catastrophic, with homes, livelihood, and even lives lost. Disasters disproportionately affect the poorest who often lack resources or access to support systems in order to get back work and rebuild their lives. In 2018 Operation Blessing provided urgent disaster relief, responding to 7 disasters in 5 states. 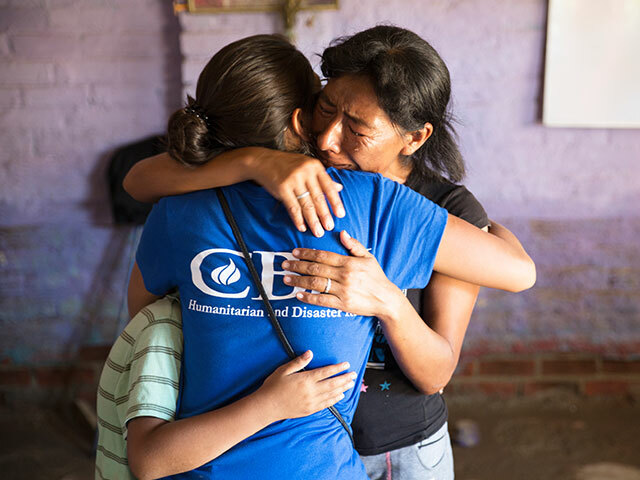 The aid provided by CBN partners has not only been in material relief, but also in the simple declaration of the Gospel of Jesus Christ, and the demonstration of love and hope in times of crisis. Operation Blessing U.S. Disaster Relief Services responded to both Hurricane Florence and Hurricane Michael—coordinated thousands of volunteers, moved resources and sending semi-truck loads full of food, water, and relief supplies to the hardest hit communities. We also contributed $453K in cash grants to local partner churches, ministries and nonprofits. OB U.S. Disaster Relief team members went to two California fires in 2018. A representative was sent to the Carr Fire in Redding, CA in August and while there conducted assessments, participated in training and provided one church grant. Later, in November, Operation Blessing sent four personnel on two different occasions to the Camp fire issuing grants and conducting assessments. The Camp fire destroyed hundreds of homes and 86 people lost their lives near Chico, CA and we will continue to work in California in 2019, supporting area churches and nonprofits while in coordination with volunteers to do sifting of ashes, cutting down trees, debris removal, and other support work. As a CBN partner you can have the confidence of knowing your gift does so many things. Whether extending arms of compassion to victims of disaster, feeding the hungry, healing the sick, or broadcasting the Gospel, each gift changes lives here in America and around the world.